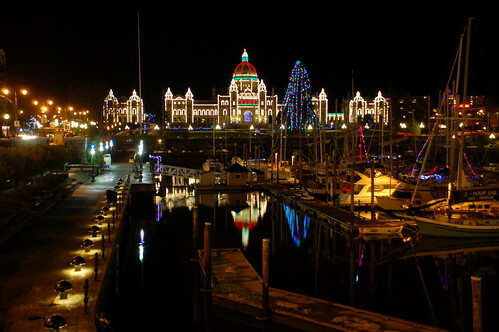 There are few places on Vancouver Island where the Christmas season feels more magical than in Victoria. With its cobbled streets, British architecture and vibrantly coloured lights on every corner, it’s near perfection. I couldn’t be more excited to be heading that way in a few short days to partake in some early holiday cheer. A modern Christmas tradition is soon returning to the capital region with the Delta Victoria Ocean Pointe Resort‘s Starlight Cinema series. Film lovers will be flocking to the waterfront resort for holiday movies under the stars, winter style. Fill your thermos with hot chocolate, pull a toque over your head, a scarf around your neck and clutch your favourite fuzzy blanket and head to the Delta Victoria Ocean Pointe Resort. Heaters will be on site for added warmth and the movies are free for all. In the true spirit of Christmas giving, the resort is graciously accepting donations for Victoria’s Santas Anonymous charity – dedicated to helping area children for more than three decades. For more information on Santas Anonymous, please visit their website. If you can’t make it to any of the Starlight Cinema nights, donations can also be made online through CanadaHelps. ← Could Vancouver Island Be Home To Kraft Hockeyville 2011?